An interview with Stacey Grubb. Zany. Extravagant. Murder. Melodrama. Absurdities. We are presenting seven short plays by Stewart Lemoine. They are some of his earliest works from the late 80s and early 90s. The Portuguese Riding Lesson is a film-noir murder mystery. The Slaw Eaters explores the origins of coleslaw. The Hostess of Belo Horizonte is a classic Latin soap opera full of melodrama. The show concludes with A Moment in Budapest which is the picture of the most perfect day. It is one of Stewart’s oldest performable works and remains one of his personal favourites. First off – seven short plays in one night… wow! Can you tell us a bit about the logistics of running the show – how many roles are the actors playing, what are the transitions like between plays, why did you decided to take on 7 shows, how long is the total run time, etc.? There are six actors in the ensemble and each actor plays between two and four roles. All of the plays are set in very different locations – a living room in Brussels, along a rock wall surrounding Dubrovnik in Croatia, a porch of a farm house, a park in Budapest. We have tried to create very different locations while keeping the number of props and the set changes manageable. The total running time is approximately 75 minutes. What is it that links these 7 Stewart Lemoine plays together for you and what did you want to convey by presenting all of them together in the same evening? Jeff Haslam, Artistic Director for Teatro La Quindicina, and Stewart Lemoine searched through Stewart’s old work and suggested the seven titles that we are presenting. There’s a combination of subtlety and extravagance in these pieces and they are classic Lemoine. It has been fun and challenging to take on the different genres in these pieces. What is it about Stewart Lemoine’s work that you love so much? I fell in love with Stewart’s work the first time I saw it. Much of his work requires the audience to go on a journey with the characters and to enter these improbable worlds that he creates. But, there is always an element that is real and that makes everything else seem possible as well. The actors in this play are all full-time, practising lawyers. Each year, a group of Edmonton lawyers come together to put on a large fundraising show for the arts community. 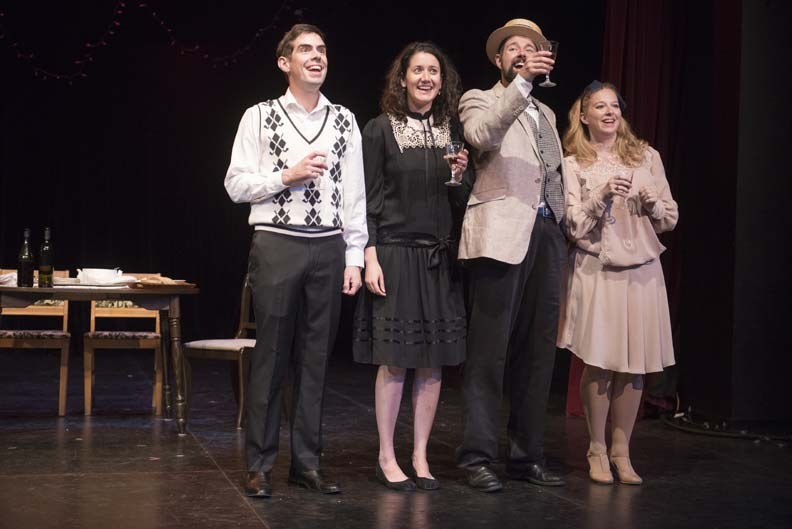 In 2014, the members of this ensemble were part of The Matchmaker directed by Jeff Haslam and Belinda Cornish. We had such a great time together that we thought it would be fun to put on a Fringe show. This show will benefit Teatro La Quindicina. We are grateful to Stewart Lemoine for allowing us to tackle his work and to Jeff Haslam who invited us into the Varscona Theatre’s home away from home at Venue 38 in the French Quarter. We are indebted to our phenomenal director Gina Moe who has worked so hard on this project. Also, we would like to thank Ian Jackson and EPIC Photography for allowing us to rehearse in their space that we all but took over with props and set pieces.